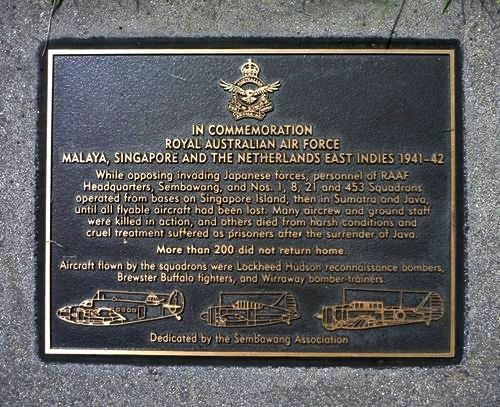 A plaque commemorates the personnel who served in the Royal Australian Air Force between 1941 and 1942 in Malaya, Singapore and the Netherlands East Indies. While opposing invading Japanese forces, personnel of RAAF Headquarters, Sembawang, and Nos. 1, 8, 21 and 453 Squadrons operated from bases on SIngapore Island, then in Sumatra and Java, until all flyable aircraft had been lost. Many aircrew and ground staff were killed in action, and others died from harsh conditions and cruel treatment suffered as prisoners after the surrender of Java. More than 200 did not return home. Aircraft flown by the squadrons were Lockheed Hudson reconnaissance bombers, Brewster Buffalo fighters, and Wirraway bomber-trainers.